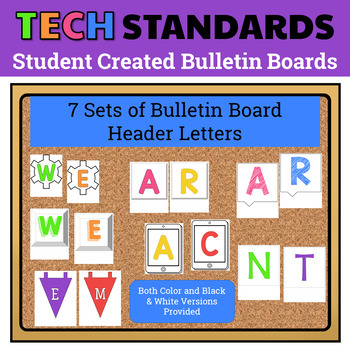 Students create the content for this bulletin board set. 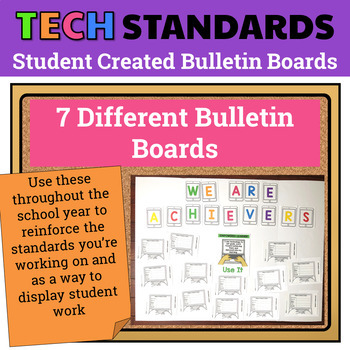 The download includes a bulletin board and corresponding student activity for each of the 7 technology standards for students. 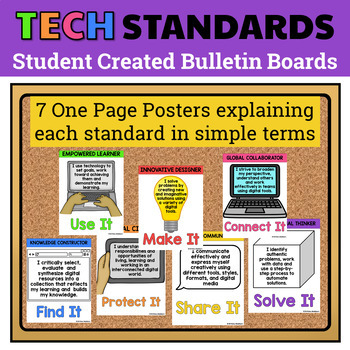 Any teacher who uses Technology standards and wants to have student created content to display in their computer lab or classroom. 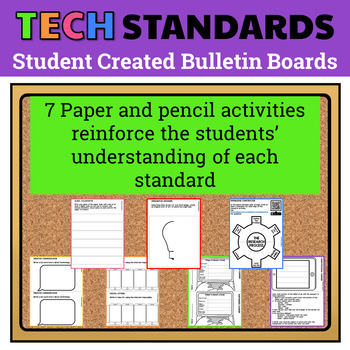 The paper and pencil activities for each bulletin board really reinforce student understanding of what each standard is asking them to learn. This set is designed to meet the needs of grades K-8. The colors are timeless and bright so you can use them with any grade level and they will be perfectly appropriate. The color profile matches the Technology Themed Decor bundle. Why pencil and paper activities? I didn't want technology literacy to get in the way for this as it is meant to help students understand the standards. You'll recognize each of these activity types but may not have connected them to the technology standards. By completing each, students will be challenged to think creatively about the meaning behind the standard. Interested in MORE Technology Themed Classroom Decor? Product Terms: Copyright © Brittany Washburn 2019. Purchasing this file entitles you to ONE classroom use. You may use this with multiple classes but may not share with any other teachers. Copying for more than one teacher, classroom, department, school, or school system is prohibited. This product may not be distributed or displayed digitally for public view. Failure to comply is a copyright infringement and a violation of the Digital Millennium Copyright Act (DMCA). Clipart and elements found in this PDF are copyrighted and cannot be extracted and used outside of this file without permission or license. If multiple licenses are needed for use my more than one teacher or in more than one computer lab, additional licenses are discounted.